24 hour, 365 days a year comprehensive reactive maintenance services. Hyden UK operate a 24 hour, 365 days a year comprehensive reactive maintenance service across the UK and Ireland. Here at Hyden UK we have a dedicated team on hand to answer your enquiries, they will be able to assist you whether it be reporting a leaking tap or you have a problem with a roller shutter. Hyden UK use the latest in vehicle tracking technology to ensure we can get our nearest engineer out to you. 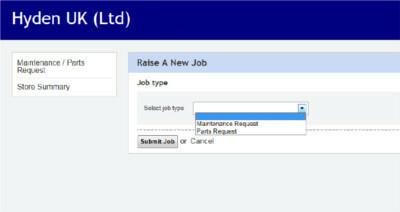 We also have a purpose built adaptable database and web portal that gives you on line access to your job status. It enables clients to check on the status of any job and can allow historic reporting with filtering options such as date, property and job type. Our team of experienced, directly employed and highly motivated engineers are multi skilled. They carry Hyden UK ID cards, wear our company uniform and are polite and approachable. Here at Hyden UK we aim to maintain your property with the minimum of disruption to yourselves, your clients or customers. The Hyden UK management team constantly monitor the quality of service and workmanship of our engineers to ensure they meet our high standards. If you would like to find out more about our nationwide reactive retail maintenance services please contact Hyden UK on 0845 450 1442.